Hand lettering is making a comeback, spurred by platforms like Instagram and Pinterest. And not just adults are getting into hand lettering and calligraphy. Kids, too, can find relaxation as well as inspiration in using hand lettering and calligraphy to create handmade projects for themselves, their families, or gifts. 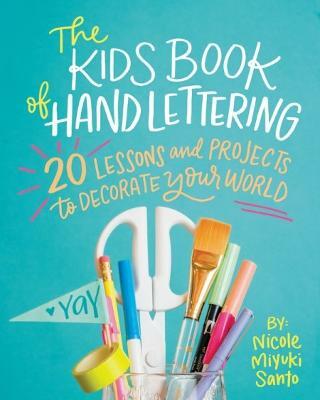 The Kids' Book of Hand Lettering will introduce young crafters to the joys of hand lettering through 20 fun and inspired hand-lettered projects that are easy to create at home. Nicole Miyuki Santo will walk children through the basics of hand lettering and calligraphy, including different lettering styles and tools (gel pens, permanent markers, and brush pens) before they begin their projects, which include room signs, bookmarks, party balloons, picture frames, tote bags, pillowcases, and more. With full-color instructional and inspired photos, practice pages to try out various hand lettering styles, and pep talks throughout to help spark the creative juices, The Kids' Book of Hand Lettering is sure to become a modern-day hand-lettering staple for crafty kids (and their parents). Nicole Miyuki Santo is a freelance artist and trained graphic designer. For the past two years she's been teaching in-person hand-lettering workshops to students of all ages and levels. She takes part in the Modern Calligraphy Summit and teaches an online course at Brit + Co. She resides in Los Angeles, California. Visit her on Instagram @nicolemiyuki.